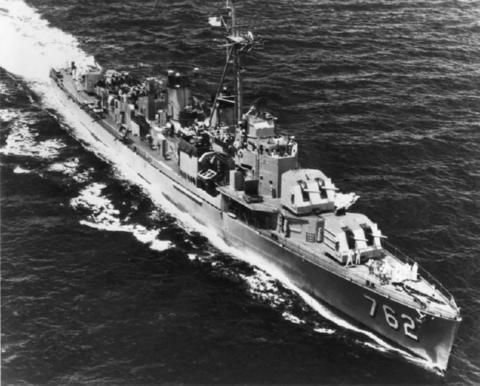 The USS HENLEY (DD-762), an Allen M. Sumner class destroyer, was commissioned on 8 OCT 1946. USS HENLEY was built by Bethlehem Steel in San Francisco, California. After fit out and shakedown HENLEY sailed for Key West, Florida via the Panama Canal. After extensive sonar training in the Caribbean, she took up station at her new homeport of Norfolk, Virginia in August 1947. HENELY began her career as an Atlantic destroyer with a Med Cruise in 1948. Briefly decommissioned and recommissioned in 1950, another "MED" followed in 1951-52. HENLEY circumnavigated the world in 1953-54, then started a regular series of Mediterranean deployments alternating with state side training and maintenance through the late 1950s. In 1959 she sailed the Great Lakes and in 1962 participated in the Cuban Missile Blockade. In 1964 HENLEY became a reserve training ship serving various units on the East Coast as a Anti-Submarine training ship. USS HENLEY served her country for 26 years, 8 months and 24 days, until decommissioned on 2 JUL 1973. The hulk of the HENLEY was scrapped by Union Minerals & Alloy of New York in 1974.